Finding a good matte and affordable bronzer locally is really hard. I would not mind using my Nars Laguna Bronzer or my Too Faced Chocolate Soleil but I find them too dramatic for everyday. Yung tipong contour na contour ang fez ko na parang may photoshoot ang lola niyo! hehe So, I find myself reaching for matte eyeshadows or darker shades of powder foundation to act as my bronzer for daily wear. I have been seeing this blusher from Tony Moly. Honestly, I would not dare buy it at all. I have that gut feel that it will not show up on my medium yellow skintone. Duh!! I was truly wrong. Sugar brown is the so called bronzer out of all the Crystal Blusher Shades. The shade is a far cry from the bronzers I have on hand which are way too pigmented on the pan. I swatched it on my wrist the first time I got hold of it and told myself... (hmm. ay pwde siyang eyeshadow). Then, when I tried it on my face this blusher worked its magic. I did not expect that this will show up on my skin beautifully. The color is a muted light brown. The powder is really smooth and I find it to be really blendable. This powder goes on smoothly on my skin when applied. This is not too powdery, hence, there are less fall outs. This gives my face that warmth of color for everyday wear. I can use it as a contour powder for a natural look or a bronzer/blusher for a sunkissed glow. On my last post about everyday wear, you can see how this blusher gave my face that shape and much needed color. What do I love about this blusher? 1. This is very affordable for 298 pesos. 2. Locally available at Tony Moly branches/stores. 3. The powder is smooth and very blendable. 4. The color is perfect for fair to medium toned girls. If you have NC40 skin and darker, this will definitely not work on you. 5. 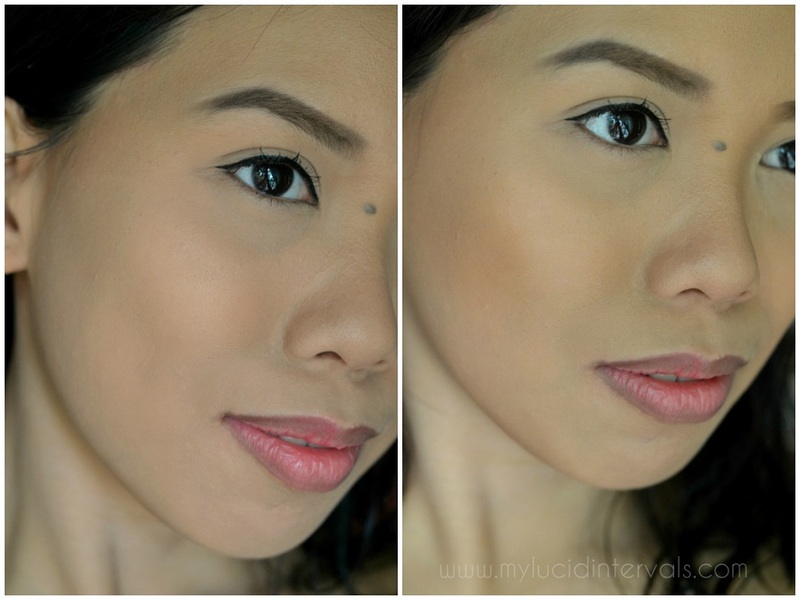 It is perfect for everyday wear because it just gives my skin a natural contoured look. What I do not like about this blusher? 1. The packaging is very fragile. 2. It does not last long on me, hence, the need for touch ups. 3. The color is not buildable on my medium skintone. If you have fairer skin, the effect will be different. Overall, I really like this powder for everyday wear. You can see on my before and after photo that the color gave a natural warmth on my face but it also did a good job of contouring it. Have you tried the Tony Moly Blusher in Bronze Brown? Hi Donna!~ I really like how this is very similar in packaging to Clinique Cheek Pops. It's simple but very classy! Nice find! I don't contour everyday, cause I have a small face in this BIG body. LOL... but I'm still on the look out for affordable contour powders. I'm currently using The Balm Bahama Mama, which is awesome but it would be great to find one that is priced around 300 pesos or less. hehe... thanks for sharing this, will check it out at the Tony Moly counter, hopefully I can find a shade that works well with my skin tone. Thank you for recommending this! I love the results. Walang shimmer. I am gonna check out Tony Moly soon! I agree--it does look natural! Maybe this is gonna be my first contour product. I've never tried using any bronzer. Maybe I should give it a go. A matte bronzer for less than 300??? I am so checking this out! Thanks!